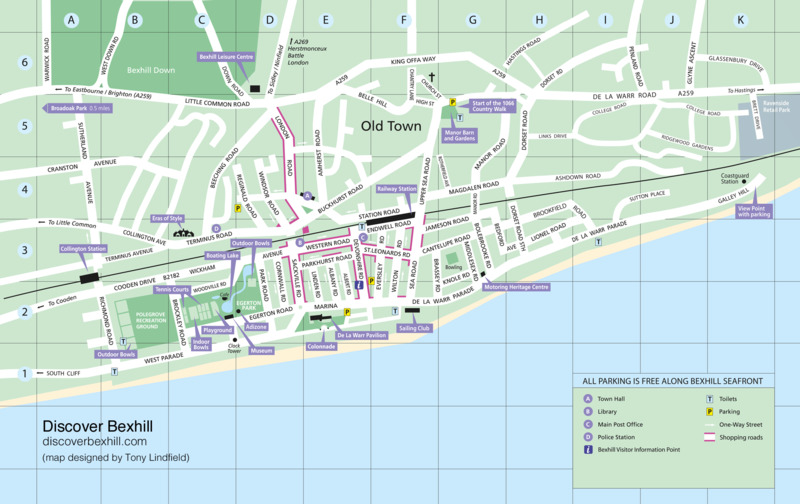 This map of Bexhill-on-Sea is maintained by Alexis Markwick. The Bexhill-OSM is a community based, open mapping project that contains information on points of interest in and around Bexhill. There are many ways in which to get to Bexhill-on-Sea. Methods of transport and directions are detailed below. Served by a good road network Bexhill is little more than 60 miles (100km) from London. The major route is the A21 which is linked to the M25, providing the main route around London. Bexhill can also be approached from the West via the A23, A27 and A259. The coastal road linking the town with the Cross Channel Ports is the A259. Frequent trains run from London Victoria (or Charing Cross via St Leonards), and the journey takes approximately 120 minutes. The coastal service runs the length of the South Coast and Bexhill is well served by the hourly service from Ashford. Frequent trains run between Brighton and Bexhill and direct trains run from Bexhill to Gatwick. National Express operates regular daily services to Bexhill from Victoria Coach Station, with connections to most cities in the UK. Bexhill is ideally situated for the ports of Dover (45 miles), Folkstone (38 miles), Newhaven (31 miles) and Ramsgate (50 miles). There are day excursions by coach from Bexhill to France, Holland and Belgium. The international London Gatwick Airport handles direct flights from all parts of the world, with internal flights operating from the rest of Britain. Gatwick is on the Victoria line, offering a direct link with Bexhill and is les than 50 miles by road. In addition, charter services operate from Lydd Airport (26 miles). For car drivers "Le Shuttle" connects the South East of England and Northern Europe from Folkstone. Alternatively, take the "Eurostar" Passenger Train to Ashford International and change at Hastings for frequent connections to Bexhill.